Prospective Rotary Club member Dr. Bret Apthorpe was our featured speaker today. 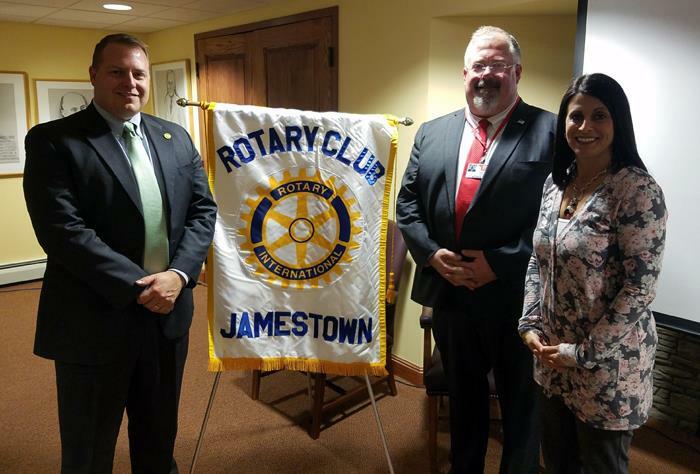 The Jamestown Public Schools Superintendent was introduced by Kevin Sixbey. Dr. Apthorpe, according to Kevin, is no stranger to Rotary. As a teenager growing up in Mayville, Dr. Apthorpe went to the Mayville Rotary Club to request that a basketball court be built. That was in 1979, and the basketball court is still there today. After graduating from Mayville in 1983, Bret went on to college (SUNY Fredonia among others), became a teacher, taught locally and around the region, and was last working in the Fairport School District before taking the position as Superintendent of JPS. Before he spoke, Bret also handed out a worksheet with 3rd Grade math questions. He said he'd come back to them later. The focus of Bret's presentation was on what they want for Jamestown's students in relation to what we want for our community. When he first came to Jamestown, Bret was convinced that the district was stuck in old ways and dysfunctional because the demographics would suggest that. Not the case at all he said, and that Jamestown is a great school district. He said the high school is very clean, safe, and so what it the problem? The problem is poverty! Bret made it clear he isn't out asking for more money or resources to help deal with the poverty issues, he's looking to leverage what they already have to fight poverty head-on. Growing up, Bret remembered the efforts to build the Sea Lion, the first 16th Century ship replica ever built in America, and right here in Chautauqua County. Many of the materials for the ship were rare and would have taken a lot of money to purchase. If it wasn't for the generosity of people, including the Lions family, the ship would never have been built. Bret stressed that the Sea Lion was built by special people with special gifts, and that JPS has the same kind of special people and gifts. Going through a series of slides, Bret showed how enrollment in K-12 at JPS has gone down the past 15 years, but, Pre-K has gone up. Race and ethnicity numbers's have also changed, with the numbers of Hispanic students rising. And poverty numbers have risen from 45% in 2000 to 71% in 2017. Because of that information, many people assume that poor, Hispanic kids can't learn, and that is simply not true. In an effort to deal with these challenges, the district will be implementing several new programs in the coming years. They will work to give kids a better understanding of what college really is, and what manufacturing really is. They will be creating a Year-Round Success Academy starting in September, 2019, for 5-12th graders. Rogers School, which is currently unused, could be brought back to life and serve as the site for this academy. Summer of 2019 will also see the start of a Community Literacy Camp for K-4th graders. And when asked where the money will come to pay for all of this, Bret said it will come from grants and that many of the programs they will use are already paid for by the Federal government. As for the 3rd Grade math questions, Bret revealed that the problem that faces most of the students that cannot answer them isn't math related, it's language related. Meaning, many 3rd Graders cannot read English, and that has to change! 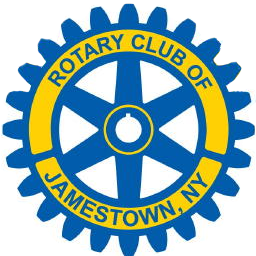 There is a lot going for the Jamestown Public School District, and Bret did a great job presenting the facts and providing potential solutions to the problems. He was thanked for his presentation, and we look forward to him soon joining Rotary as a member!